Gaggia Brera Coffee Machine Review: Your Personal Home Barista or A Waste of Money? Coffee Geek Lab / Gaggia Brera Coffee Machine Review: Your Personal Home Barista or A Waste of Money? We all know that in the 21st century, you can turn your kitchen into a coffee shop and enjoy fresh espressos every day. And there are many coffee machines to help you with that. One of them is the Brera by Gaggia. And as you already know, it’s the star of my today’s review. Let’s take a closer look at the Gaggia Brera coffee machine and see what it has to offer and whether it’s really worth your money. dimensions: 12.4 x 10 x 17.5 inches. 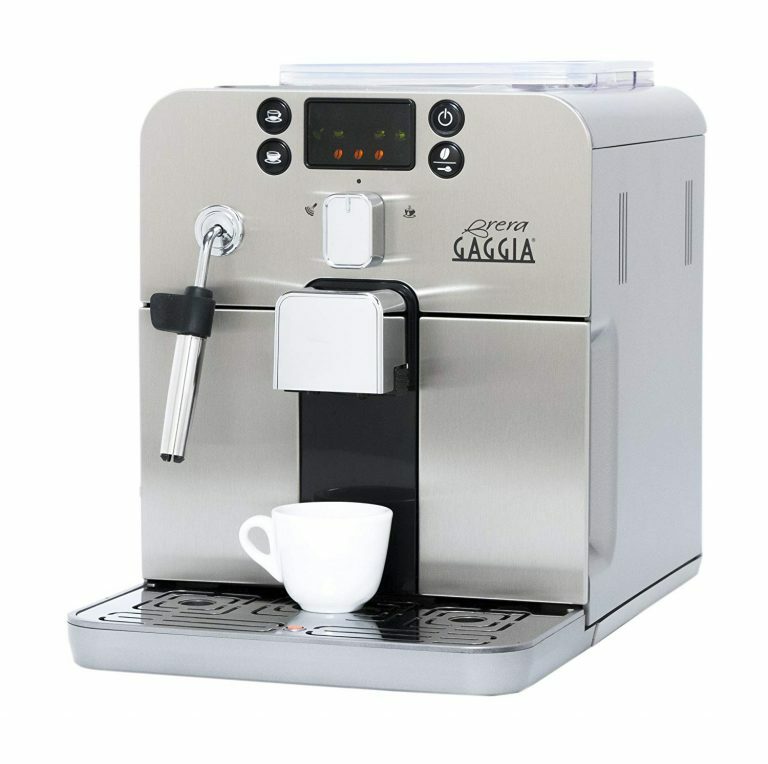 The first factor I want to mention in my Gaggia Brera review is the design of the machine. The way it is built determines its functionality, and the appearance matters to many users. So, let’s talk about that. When looking at the Brera, you can think that this machine really is a piece of professional equipment. Its stainless steel front panel really looks stylish and durable. Unfortunately, not all the parts are steel. There are some plastic components, including the sides of the machine and its control knob. The good news is, those plastic parts aren’t very thin and feel quite sturdy. I believe they can stand regular use without a problem. Still, the presence of those plastic components kind of diminishes the overall quality feel of this espresso machine. 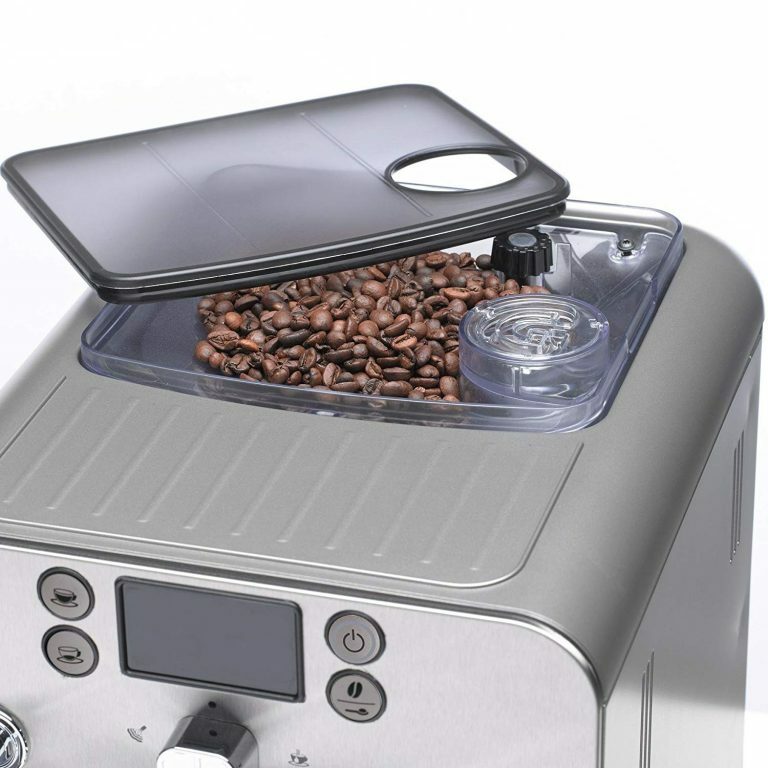 This model also comes with a steam wand (to froth milk), an integrated burr grinder (which is located on the top), a removable water reservoir, a pre-ground coffee doser, and a removable brewing unit. This design allows for easy maintenance and use. This is a super automatic machine, meaning it was designed to do the job for you. The Brera will grind your beans, heat the water up, pre-infuse the grounds (if you want it to), and brew your espresso. The control panel at the front has a user-friendly design. The LED lights show the options you have, and simple button controls allow you to customize and adjust your beverages. There are just 4 buttons on the panel near the screen. They are easy to operate but allow users to make different drinks and adjust them to their personal preferences. If you appreciate convenience in use, you are going to love the Brera’s telescopic coffee dispenser. It allows users to adjust the height, which means you can fit different mug sizes under the dispenser. Whether it’s your favorite cup or a special mug for a coffee-based milk beverage, you can brew your espresso directly into it. This is another important part of my Gaggia Brera review. This coffee machine packs a great set of features, but how does it perform? And can it satisfy more demanding users? This model can be considered a rather basic espresso maker. However, in the world of super automatic machines, “basic” really means a lot. The Brera is a highly functional brewer, as it combines convenience and many helpful features. This is a 15-bar pressure machine that brews espresso and other espresso-based beverages (thanks to the incorporated steam wand). It grinds, tamps, and brews coffee with a touch of a button. For home use, this is a rather easy-to-operate model. Now, there are a couple of functions you may find helpful. For instance, the Brera allows for pre-infusion. Not all coffee lovers use this function, but it can really enhance the flavor of your beverage. You can brew different coffee strengths too by picking a specific coffee + water ratio. There are three options: light, medium, and strong. You can also pick the grind size (there are five options). Such a combo of features allows users to experiment with their beverages and find that perfect combo for their desired cup of coffee. This model also implements the Rapid Steam Technology, which allows the machine to heat the steam up in less than 10 seconds. You can make coffee-based beverages like latte, cappuccino, macchiato, etc. The Brera brews two coffee sizes: a standard espresso shot and a long one. There is also a double shot option, which implies the machine grinding two times more beans and brewing super strong espresso (in a regular shot size). What’s really great about the Brera is its automatic rinse cycle, which activates every time you turn the machine on. Basically, the machine just runs hot water through its interior components and into your mug (yes, don’t forget to place a mug under the dispenser before turning the machine on to catch the hot water). This process is beneficial for different reasons. It warms the machine up and helps you get a smoother beverage. Additionally, this helps with keeping the coffee maker clean. The water tank comes with a water filter that has to be changed regularly. This means you can even use tap water with the Brera (even though it’s not really recommended despite the filter). Now, in terms of performance, this model has all the essentials. It works fast and does all the job for you, which is a huge plus. What might disappoint you is the noise. When grinding the beans, the Brera gets quite loud. The steam wand is noticeably loud too. These aspects aren’t critical (I’ve tested machines that were far noisier). Still, if you decide to make coffee early in the morning, chances are you will wake up everyone in your home. This is probably the most important aspect for many coffee lovers out there. I mean, that’s the main reason why we buy espresso machines: because we want to have exceptional quality coffee at home. 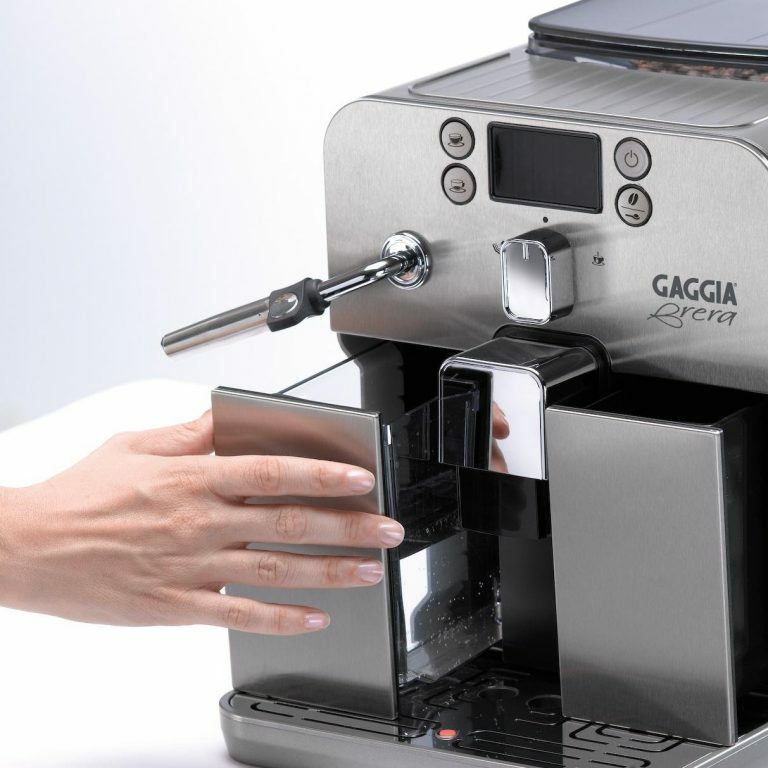 Now, when it comes to the Gaggia Brera, the subject may seem contradictory. Some say that 15 bars of pressure is too much (since the optimal pressure for espresso is often considered to be 9 bars). Others note that it doesn’t matter as long as your coffee tastes like one from the coffee shop. But let me just tell you this: Even though this isn’t a 9-bar pressure machine, it makes exceptionally good espressos. Perhaps, not as good as a super high-class professional machine would make, but still great. If you pick high-quality beans, I am sure that each of your espressos will have a bold taste, a full body, and a rich crema. As for the milk beverages, there’s also nothing bad to say here. The steam wand froths milk fast and creates thick, fluffy foam. You can add it to your espresso and make cappuccino (or add a bit more and make creamy lattes, whichever you prefer). Gaggia is one of the oldest coffee machine brands. It can easily be called the godfather of home espresso makers. And the name of the brand is associated with quality materials and good-tasting coffee. This is definitely the brand users can trust. Espresso machines can be quite tricky to clean and maintain in good condition. Some parts cannot be removed but need to be cleaned properly, plus there’s always potential scale buildup on the internal components. Being a rather user-friendly model, the Brera is also very easy to clean. First of all, it has an automatic rinse function that runs the hot water through the system every time the machine is turned on. This will suffice for daily cleaning. Additionally, you can wipe the exterior, the steam wand, and the coffee puck bin after each use. For a more thorough cleaning (once a week), you should do a bit more. First off, the steam wand can be disassembled, so you can thoroughly wipe all the pieces. Forget about your dishwasher – it can damage the material of the machine. Yes, you will have to do everything by hand, but it’s not that hard, trust me. The brewing unit of the Brera is removable. This means you can take it out weekly and rinse it thoroughly. This will help you keep all the parts in good condition. Plus, the quality of your beverages will remain superb. Keep in mind that the Brera has a warming tray for the cups. It is heated by the boiler (passively) and keeps the mugs and the beverages at the optimal temperature. You can also try warming your mug up before brewing coffee into it and see which option works best for you. Now, keep in mind that your espresso machine will also need regular descaling. When there’s a scale buildup inside your brewer, the coffee flavor will decrease greatly. So, every now and then, the descaling process is a necessity. It’s not hard but will require some time. This is crazy, but your Brera will actually notify you when it’s time to descale it. You will need to buy a special solution since it doesn’t come with the machine. The descaling process is fairly simple: You just need to run a cycle with that special solution, and then a couple of extra hot water cycles to rinse everything out. Not that hard, right? The whole process usually takes around 40 minutes, and I hate to disappoint you, but you need to be there almost the whole time. You will need to start each cycle, fill the water reservoir, place a container under the dispenser, empty the container, and so on. So, it’s probably best to descale your espresso machine when you’re having a day off. nicely built and seems reliable (even the plastic parts). the water tank is rather small, so if you drink a lot of coffee, you will have to refill it quite often. prefer having control over your beverages and some customization options. So, what are your thoughts on this espresso machine? Do you think it can become a good addition to your kitchen equipment? And what coffee beverages do you plan to make with it? Let us know in the comment section down below!